Potato chips are my favorite snack… well, one of ’em. But with all the noise about GMO, trans fats and salt; it’s becoming harder and harder to REALLY enjoy them without concern, unless you either want to spend a little more on healthier brands, or just say “eff it” and enjoy them AND the repercussions anyway. Personally? I don’t have any intentions of totally giving up potato chips. However, I don’t have a problem with cutting back on them and finding other, healthier ways of satisfying my “crunchy salt tooth” from time-to-time. A healthy, yet delicious alternative to potato chips? 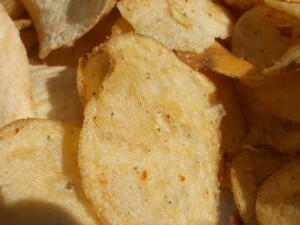 What comes to mind when pondering healthy substitutes for crispy, crunchy, salty potato chips? One could be popcorn, although it’s another questionable snack food due to the whole GMO corn thing, as well as, the thing with microwaves, fake butter, and the fact that it’s a “dreaded” carb. Then there are nuts and, oftentimes, a couple of handfuls of sea salted cashews do the trick for me. There is one other thing that comes to mind that I don’t think anyone could argue with – then again, folks will find a way to argue against ANY-thing. Now, before you turn your nose up and say, “ugh“… just know that despite being made from a green leaf vegetable, kale chips are delicious… light, crispy, and depending on what you put on them, they can be a flavor sensation! To my knowledge, there aren’t any potato chips out there (even the natural ones) that actually benefit you. Kale chips, however, can! There are many variations you can create… or buy. The store bought ones are pretty good, I guess. Just be sure to get them from a natural foods store or the natural foods section of your regular store. Personally, I’ve always made my own. I’ve done plain sea salt, sea salt -N- vinegar, spicy and one of my favorites, teriyaki flavored. You can feel free to get creative and add any seasonings you feel you might like. Preheat oven to 250 degrees. 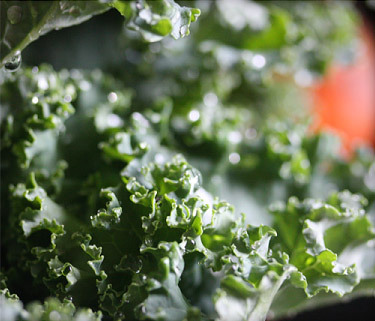 Rinse your kale leaves to remove any dirt and debris and then dry with paper towel. Tear your kale leaves into quarter sized pieces and drizzle with the olive oil. Massage the oil into the leaves with your hands, then place the pieces on a baking sheet lined with parchment paper. Bake for about 20 minutes, turning the leaves about halfway through (after 10 minutes). Remove from oven and allow to cool a bit before enjoying. If they’re not crispy enough, bake and check after another 5-10 minutes. Remove from oven, put them into a storage bag or bowl with lid and gently toss with Real Salt brand sea salt or Celtic sea salt. Store in bag or an airtight container. They can be enjoyed alone or crumbled into salads or soups. Preheat oven to 250 degrees. Rinse your kale leaves to remove any dirt and debris and then dry with paper towel. Set aside. Combine all of the other ingredients in a large bowl and mix well. Tear your kale leaves into quarter sized pieces and then place into the mixture. Massage the mixture into the leaves with your hands. Allow to marinate for at least 15 minutes (the longer the better) and then place the pieces on a baking sheet lined with parchment paper. Bake for about 20 minutes, turning the leaves about halfway through (after 10 minutes). Remove from oven and allow to cool a bit before enjoying. 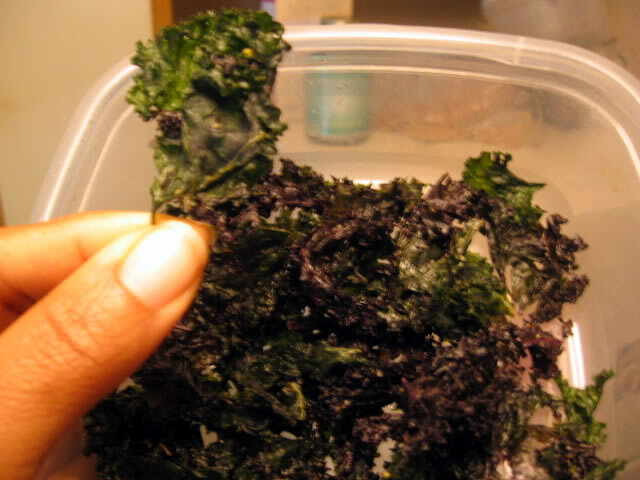 For salt and vinegar kale chips, simply add a tablespoon or two of vinegar to the olive oil and massage both into the kale leaves, bake as directed, and toss with sea salt once they’re done. After all that, you still just gotta have those chips? As much as I love kale chips, sometimes they just don’t cut it. There are definitely times when they suffice, but others… not so much. In those instances, if you don’t want to get the Lay’s, Jay’s, Tom’s or Better Made, there are healthier varieties that don’t have hydrogenated oils, regular table salt, or GMOs. There are even some cooked in avocado oil as opposed to peanut, canola, or vegetable oils! Seek them out in your local natural food stores such as Trader Joe’s, Whole Foods and local co-ops if those are available in your area.